Do you have a story to tell to raise awareness of an important issue? Please get in touch with us. Celebrity bodyguard Ricky, 27, was stabbed in the leg on his own doorstep when he tried to stop his brother’s scooter from being stolen. His mum Suzanne was forced to gather her family at hospital to say goodbye to her son. Two years on – and after his killer was jailed – she bravely spoke out. We helped Suzanne tell her story, and share a final photo of him in hospital, in a bid to stop young men carrying knives. How to Sell My Story: Simply fill out the form on this page to sell a story. Tell us the main points of your story and we’ll get back to you if it’s something we can place in a national magazine or newspaper for you. We’ll pay you (or a charity of your choice) for sharing your story. We pay the highest rates for newsworthy stories, videos or photos. 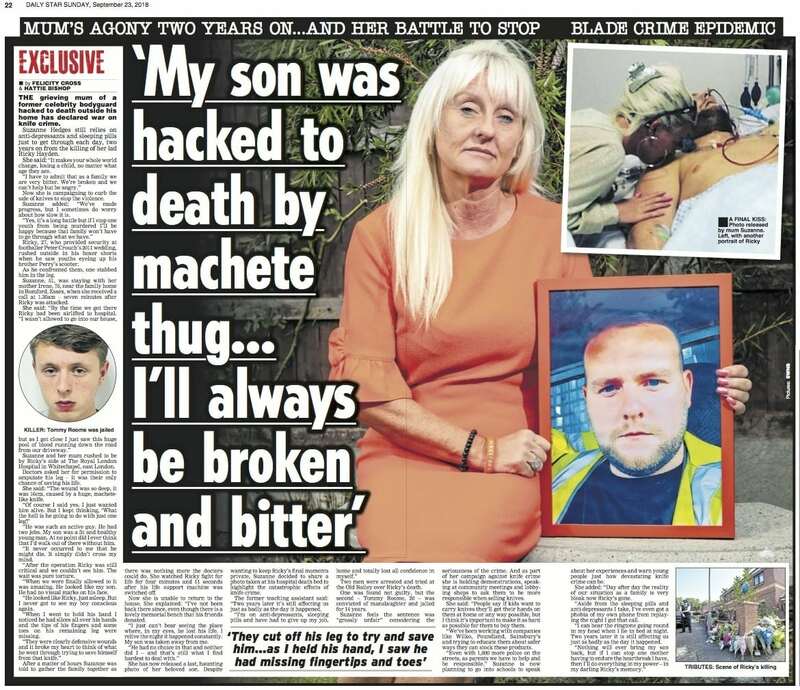 One of the ways that Suzanne has faced her grief is by throwing herself into campaigning and raising awareness about knife crime. As well as holding demonstrations and attending and speaking at residents and community meetings they have been lobbying UK shops that stock knives to do so more responsibly. Suzanne is currently planning to go into schools to speak about her experiences. She wants to highlight to young people just how devastating knife crime can be. Our reporter Hattie secured Suzanne an exclusive in the Star on Sunday. Subsequently we arranged further coverage in The Daily Telegraph, The Daily Express and the Daily Mirror. We hope that Suzanne’s important message reaches as many people as possible. If you have an important story to tell, then we’d like to hear from you. We can help you tell your story in your own words, and help you share it with a wide audience. Our professional reporters will listen to all your concerns and help you every step of the way. Whats more, we guarantee the highest payments to you or a charity of your choice.